Click for a brief summary of the book of Exodus. When my tasks seem more than I can bear, I shall remember that after Pithom comes Elim, after Raamses comes Sinai! The burdens are sure to slip off, if they are borne with Christian grace. The chains are sure to fall away, if I am a bond-slave of Christ. God will lay upon me no weight too heavy for my back; nor will He allow men to overburden me. Though kings plot against me, and an empire is in arms to my hurt, a barrier of bulrushes will be sufficient protection, if God is with me. He will fashion a fort for me out of the palaces of my enemies, and a guard for me out of their tallest soldiers. No harm can befall me, while God befalls me, in this world or in any world. O my Father, I will trust Thee today and forever! No burning bush for me? Why, my God surrounds my life with burning bushes! Wherever I turn, they blaze up before me. Appeals, warnings, exhortations, promises, guidances, providences, glories, rewards, powers,—the world is crowded with radiant beckonings to service! Forbid, O God, that I should pass by unheeding, to herd my selfish sheep! “Bricks without straw!” How much of my life is like that! Tasks, tasks, tasks, lacking health, and strength, and wisdom, and courage, and perseverance, and grace! But it was not bricks without—God; nor is it ever tasks without God. Let me remember that this very hour. Is not Jehovah my God as well as the God of Israel? Has He ever been more to any man than He will gladly be to me? Did He ever bring a soul out of his distresses and will not bring me out of mine? I will appropriate every promise, every assurance, every fulfillment, in all the history of the world. It all belongs to me, to me! 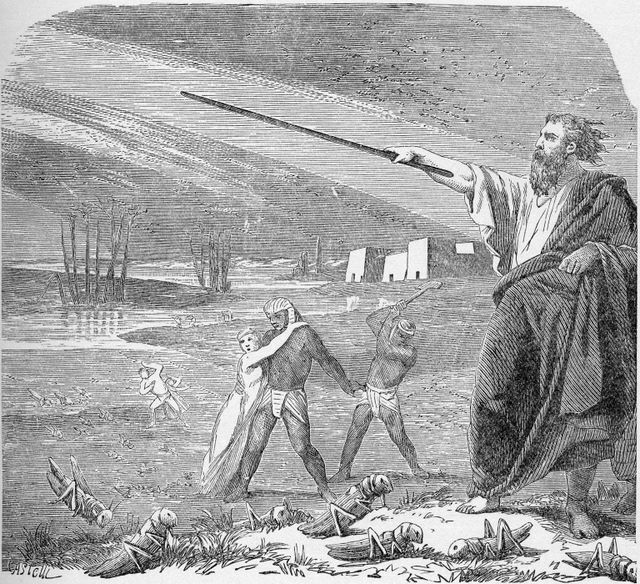 Behold, the Lord has given to me, as to Moses, a wonder-working rod! I bear about with me the symbol and assurance of God’s presence and power. Lo, He is with me always. Yet how often, alas! I use the rod as a walking-stick, and think no more about it! Pharaoh hardened his heart before God hardened it! The king repulsed the plea of pity until God could no longer pity him. God fixed him in evil, but only after he had proved his unalterable will for evil. Oh, Almighty Judge, may no such fate be mine! May I fix my heart on Thee, that it may not be fixed in wickedness! Alas for my folly, in which I join Pharaoh and all the long line of fools! I sin, and misfortunes come. I think they will pass, and continue to sin. They do not pass, but increase. I refuse to connect them with my sin. How must God grieve, when even His wisest and best-contrived penalties do not move His rebellious child! God’s warnings will not continue forever. To me, as to Pharaoh, will come a final message. How do I know when it will come? How did Pharaoh know? He did not know, nor do I. He was gratified, like a fool, by the removal of each plague, and went on in his folly. Let me not scorn him till I am sure I am not doing the same. I do not fear the death of the body. That, I know, is only an incident, a passing incident, to my continuing career. I look forward to it with equanimity. But my dread is of the death of the soul, a death that may come upon me at any time if I do not break with sin. What was the horror of that Egyptian midnight, what that carnival of woe, compared with this death of the soul? Has the death angel passed over my soul? Has only the dark shadow fallen upon me with its warning, and then hastened away? Do I stand again in the safe sunshine of God’s love? It is no grace of mine, but all of Another. It is no merit of mine, but Another’s sacrifice. Oh, endless praise be to Him who has delivered me from this death! Not only has the shadow passed by me, but I am given leadership for my safety, day and night. Fire and cloud—fire which I fear because of its power, cloud which I dread for its darkness—these awful omen’s God has transformed into the symbols of my salvation. By His very terrors I am guided, by His flaming omnipotence I am led! Many a time it has stretched out before me, some sea of discouragement, difficulty, danger. The waves run high, the wind blows, the enemy press on behind; I hear their rattling chariot wheels, their shouts of triumph. And then the sea has become a cloistered pathway, and I have passed through untouched by a wave, while all my foes have been swallowed up. This has happened, all this, yet still I fear for the future! Lo, God has changed all my bitter springs to sweet water, and all my Marahs to Elims! There is no sorrow that has not issued in joy, no failure He has not transformed to success. That has been when I gave my life into His keeping, as I shall do today. Is this world a desert? I know men say it is, but where’s the proof? I am housed beneath the covering of God’s protection, I am abundantly fed with the manna of God’s love, I am led by the pillar and cloud of God’s providences. With shelter, food, and a highway, where is the desert? O my God, how endlessly good art Thou! My rebellion is often hot against God. I do not acknowledge it to myself, but God understands! He hears my complaints: “Why didst Thou bring me into this hard place? Wilt Thou slay me with thirst?” And then, perchance, my Father opens for me a fountain out of the very rocks that hem me in. He would have done it anyway; how much better had He done it without my complaints! Surely I am indispensable! Surely no one else can do the work! Surely the Lord rests upon me, and His Kingdom is established on the rock of my faithfulness! Thus I talk with myself. Oh, let my better sense be the Jethro. Let it show me how well the world progressed before I was born and will progress after I die, and bid me toil with a less immodest frenzy. Let me work with others, gladly sharing with them the toil, the praise, and the reward. God does not speak to me as He spoke to Moses and Moses’ people. With good reason, too, for I do not make ready to hear Him. I have not purified my heart and life. I have not expected Him and been attent. Every day is a possible Sinai. Oh, let me go softly, waiting for the trumpet peal! Part of the Commandments are easy for me; God forbid that my obedience there should satisfy me, as certainly it does not satisfy God. For part of them are terribly hard. That part is my Decalogue. Over that part I must pray and groan. There is my test, and by that obedience or disobedience I stand or fall. Let me count it my pride and joy to be a bond-slave of the Lord! Not for six years shall my service be, and a glad release on the seventh; but gladly for all years, and release to be counted the most terrible of disasters. My ear to Thy door post, O Thou Most High! My hands are heavy with fate. Fortunes of friends, of neighbors, of children, of other dear ones, of the community, the state, the farthest tribe, are in my keeping. My life is not well lived unless through me their lives are well lived or better lived. Who, without divine help, is equal to these things? But the help always comes. of the life that is rightfully mine! Not at the foot of a literal Sinai, awful with the presence of a visible Deity, have I made my covenant with the Almighty. No; but beneath the sublime arch of heaven, and before the unseen throne of the Infinite One! I am His. My life is His. I am not my own. Shall I consider this day as mine? Shall I be false to my solemn vow? And how then can I expect my God to bestow His covenanted blessings? There are so many millions of Christians, wealthy, strong, zealous, and wise. They do not need me, or my small offering. Ah, but do I not need, all the more, to give it? Do I not need to identify myself with this great task, and the more because it is so great and prosperous? Yet how do I know they do not need me? And do I not know that God–even God Himself–does need me? What sanctuary am I fashioning for my God? I know the temple He desires. My body–ah, wonderful thought!–He has deigned to seek as His temple. Could higher honor come to me, among all earth’s crowns and kingdoms? Lord, for purity of heart! Lord, for obedience of will! Upon what shall I lift up my sacrifice to Thee, O Thou Most High? Thou dost not seek stones heaped up, though of beryl or chrysolite. Thou dost wish rather the altar of my affections. Thou art best pleased with my prayers when they lie upon my heart and are founded upon my life. Such shall be my communing with Thee henceforth, O my Father. Why should not I, as well as Aaron, wear upon my heart the names of those dear to me,–yet, of all those, to the ends of the earth, who are dear to my Lord? And why should I not wear upon my very forehead, “Holy to the Lord”? Be my vesture day by day a sacred robe, however commonplace to the eye of men; and in it may I walk as becomes a priest of the Most High. Not Aaron, not any of his sons, was more a priest of God than I am. Some share have I in the worship of the church and my home; and I alone minister in that sacred temple of my heart, where God enters and dwells. I would live worthily of this exalted dignity. Shall a priest profane himself? What incense shall I offer Thee, most glorious, most bountiful, most loving One? My words; Thou delightest even in my stammering praise. My life; with all its failures, it is dedicated to Thee. My prayers; halting, stumbling, mistaken, yet they climb to Thee. My love,–ah, that is best of all, and includes them all, and–wonder of wonders!–it but reflects Thy love for me! They are to be “a perpetual covenant,” it seems. A token of my fidelity to God. A token of God’s love for me. Days of communion, days of partnership, days of friendship. If I break away from them, am I not breaking away from God? Ah, let me make my Sabbath a delight! Let me love its every hour, because I love its God! Too often my ideals go up on a mountain, and a cloud removes them from sight, but I stay down on the lower levels of life, where the base memories are, and the pressures of trivial needs. It is so easy, there, to make an idol of my folly, and bow down before it. Gold? Fame? Ease? Pleasure? Oh, my God! Whatever it is, help me to grind it to powder! O God, show me Thyself! If I can see Thee, I can look all enemies in the face. If I can see Thee once, I will henceforth see Thee everywhere. If I can see Thee, life will become a long, glad journey toward the vision of Thee forever. But a glimpse of Thee, even of the gesture of Thy hand, even of the corner of Thy robe, O my Father! Up in the mount with God! Oh, may no triviality detain me, no obstacle bar me, no sin, basely cherished, unfit me for that high privilege. That my face shall shine for the glory of it I care not, as I shall not know, though others will know; but my heart will shine, and the sun will dwell in all my life. Yes, “early in the morning,” up in the mount with God! Is my heart willing for its gifts? What I set apart for the Lord, of time, or money, or strength, do I set apart gladly, or grudgingly? Do I long for chances of service, or shrink from them? Is my heart in the work, or only my calculating head? 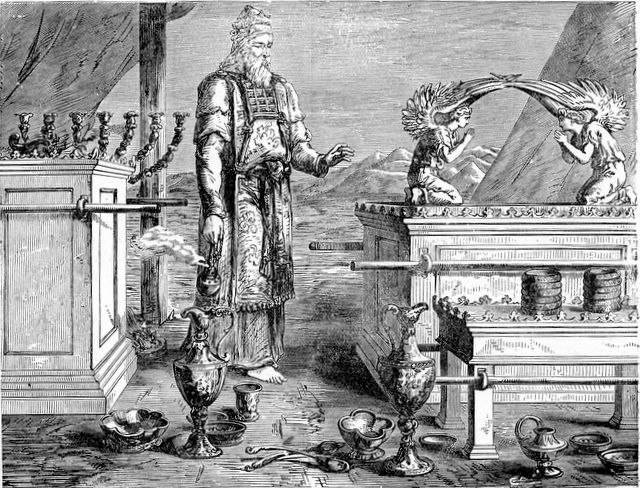 Let me learn from these ancient builders of the tabernacle, and let today be a divine temple on which I shall lavish myself lovingly for the Lord. I should take more pride in my work for the Lord. When I speak, the words should be my choicest. When I plan, I should be ambitious, prudent, courageous. When I execute, I should be indefatigable. I must not allow my secular work to be better done than my religious work. Sockets and clasps and “fine twined linen”–let my work for God be perfect and praiseworthy! I need–oh, how I need to find God! Whether the blessed Presence flames forth from between golden cherubim, or speaks invisible in the quiet of some morning hour, I need the mercy seat! The ark has perished, but the reality it embodied has not perished. The mercy seat of gold is gone, but mercy remains, at my very hand, ready to forgive me and bless me at a word. To what uses do I put my gold? Am I most interested in weighing it out for the Kingdom, or for my own pleasures, or for hoarding it in the bank? Do I really believe that the money I use as God would have me use it is the only money I really have? And if I believe this, do I really act on that belief? What do I take as the breastplate of my life, my defense against the darts of the evil one? Is it such steel and hammered brass as the world furnishes, masses of money, solid force, aggressive ambition? Or is it such breastplate as God furnishes, –twelve precious stones, engraved with the names of His people, the tokens of His church? Is love for God and man the safety in which I confide? Ah, it will never fail me! As often as I go to church, do I meet my God? Do I go confidently expecting to meet that dread, that beloved, Presence? I know I shall see my friends there; am I as sure that I shall see Him there? Ah, let me find myself in a true “tent of meeting” next Sunday!